Short stories, poetry, inspiration & words that dance. I know without doubt that Angels are real. but not everyone calls out to them. That same book said, “It’s the simplest thing to call out to them, they’ve just been waiting for you all your life. Let your prayer to them be a simple one. Lead me in all matters of my life, for my highest good. Give me a sign that I can understand that you are here.” It went on to say that Angels are God’s creatures that can’t be commanded for a sign, you have to ask with love! And then it said that although it wasn’t the rule, one of the common signs was finding pennies in unexpected places, someplace you really don’t expect to see them like your bathroom or your porch! That same day my eyes darted around and well….. nothing, no pennies or anything! I open it and a penny falls on my lap from the book of Angels! That penny is now wrapped in a purple ribbon around grandpa’s old candle-stand so that I never forget they are here! If you believe in Angels, then they’ll be right by your side. God loves us so much, to the extent that he made for each one of us creatures of heaven, called guardian Angels to lead us to our highest good! Your highest good is simply that which, will in the end bring you true joy and love. There are paths I’ve chosen that I thought were excellent choices at the time I made them, but nothing made me feel more miserable. The Angels see far beyond what we can, all that’s invisible in the future and all that’s asleep dreaming within our soul. Asking them to show the way, is walking toward love and joy. After all they come from the one who made us. So the next day, Jovin who hasn’t met me in three whole years, barges in inquiring about this stranger. There are so many things he could ask me first, after all this time, but it’s the very first thing he says. 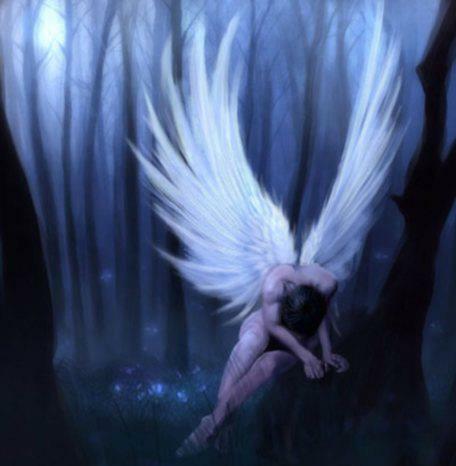 I hug him for bringing me my Omen and I know that my Angels will lead that stranger, to read the words I now write. ← Oh what are you searching for? Shenaz, I love the way you write, it instantly connects with me….. I’ve read most of your blog…. You should think of writing a book of what you know…… And if you do, I would be one of the first to read it…… Keep up the awesome blog…. Love and light to you…. All love to you too! yes ANGELS ARE CELESTIAL BEINGS. The paintings i have been doing are all turning out with angels!!!! !i do not understand whats happening !!!! But i thank the angels who are guiding me.i asked for signs too ………. and hey your blog is on ANGELS. I TRULY BELIEVE IN THEM AND THEIR LOVE AND GUIDANCE. May them bless u too and lead u on to whatever u are seeking. That is just sooo beautiful to know and hear, that you feel them too and that they’re showing themselves in your paintings and that we’re all connected with the same web. You my love are the most beautiful angel, and your guardian angels will always protect and look out for you. You will one day be the most amazing & well-known writer of our generation, n i absolutely believe in you and know-so 🙂 ❤ ! The sky is on fire . . .